Smith (ankle) was claimed off waivers by the Angels on Friday. Smith will provide additional depth at the catching position for an Angels team that currently has two other backstops on the 40-man roster (Francisco Arica and Jose Briceno) after designating Joe Hudson for assignment in a corresponding move. Across 52 games this past season, Smith hit .292/.348/.380 with three home runs and 21 RBI after missing the first couple months due to a Grade 1 ankle sprain he suffered in spring training. 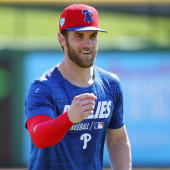 The 30-year-old is expected to undergo surgery on the ankle this offseason, though he should be ready to go for spring training.